Japanese Boy's Festival on May 5th! Japanese Boy's Festival(Tango-no-Sekku) on May 5th is the event parents wish for their boy to grow to be strong and wise. Most Japanese celebrate this until boys graduate from a primary school. On the other hand, Girl's Festival(Momo-no-Sekku) on the 3rd of March is the event for girls. In Japanese Boy's Festival, parents display Japanese armour and helmet with wishing for their boys to succeed in his life. Because the more high rank samurai was, the more samurai wear luxuly and storng armour and helmet in smurai society during the medieval period of Japan. In addition, displaying them is a charm used as protection against disease and disaster. The price of helmet is between 10,000yen(about 100dollars) and 500,000yen(about 5,000dollars), golden helmet's price is over 500,000yen. The price of armour start at 100,000yen(about 1,000dollars). Nowadays some Japanese buy and display helmet only because of the high price of armour and small house. 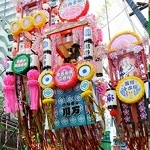 In addition, parents display carp streamer(Koi-Nobori) which is carp-shaped wind socks. Carp is a tough fish which can live dirty liver, and is a symbol of success in life in China. Parents display it with wishing that. The size of basic carp streamer measures 1.5m(about five feet) wide by 2.0m(about seven feet), and most Japanese display it in a garden. Japanese live in an apartment buy a small carp streamer for indoor or portable(desktop) carp streamer. The price of small carp streamer is about 3,000yen(30 dollars), while the price of basic it start at 20,000yen(about 200dollars). After displaying above that, Japanese eat Chimaki or Kashiwa-mochi or both of them. 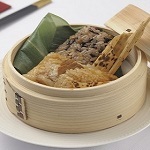 Chimaki comes from China is made of glutinous rice stuffed with fillings and wrapped in leaves, Kashiwa-mochi originated in Japan is made of glutinous rice stuffed with sweet bean paste and wrapped in an oak leave. Oak leaves are regarded to be a symbol of prosperity because they don't fall until a new sprout has emerged. Most Japanese buy them in grocery storess or convenience stores recently. 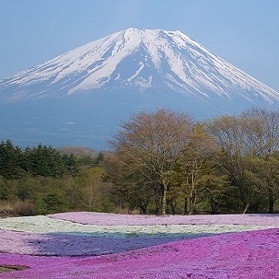 Not just Japanese celebrate Boy's Festival buy them, but also Japanese want to enjoy spring feature buy them. In some regions, Boy's festival is also an event in spring to pray for Gokokuhojo (bumper crop) and state of good health over the year. People take a bath with Acorus calamus(sweet flag) called Shobu-yu, and believe that can purge noxius vapors. If you travel Japan in the begining of May, you can enjoy Kashiwa-mochi and Shobu-yu and experience Japanese culture through them.